[toc]Cirrhosis is the scarring of the liver that is caused by chronic liver disease. Your liver is the largest organ in your body that helps to neutralize harmful toxins that can cause various illnesses in your body. It also helps to produce useful proteins that aid in blood coagulation. Liver helps your body to absorb many fat-soluble vitamins and helps nourish your body. When this vital organ of the body stops functioning properly due to a liver disease, and gets scarred, many normal functions of the body get affected. Cirrhosis may cause initial symptoms like nausea and vomiting, which get worse as the disease progresses. The scarred tissue prevents proper flow of bile and through the liver, thus keeping the liver from working normally. Some of the commonly observed symptoms are fatigue, weakness, loss of appetite, swelling in the legs or abdomen, weight loss, yellowing of the skin, redness in the palms, and jaundice. The most common cause of cirrhosis is alcohol abuse. Apart from this, hepatitis C, autoimmune inflammation of the liver, non-alcoholic steatohepatitis, certain metabolic disorders, blocked bile ducts, toxins and some medications can also cause hepatitis. This condition requires regular monitoring and treatment, and if left untreated it can turn fatal. Herbal remedies can help to prevent cirrhosis and damage to the liver. 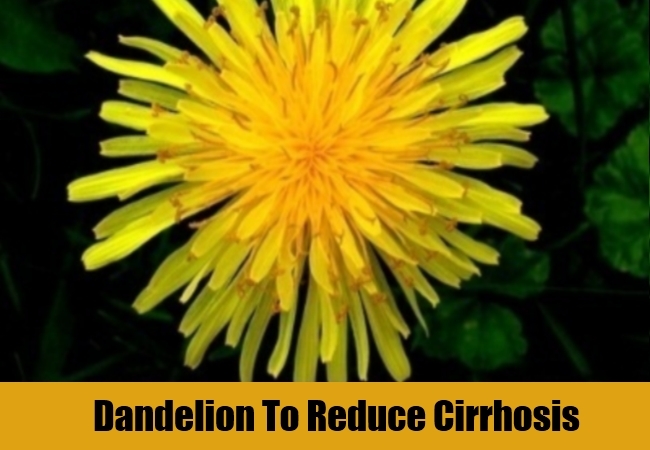 Given here are some of the effective herbal remedies for cirrhosis. Turmeric provides many health benefits and is used for treating many health ailments. It helps to flush out harmful toxins from the body which harm the liver. It protects your liver from damage and is the best herb to reduce the inflammation in the liver tissue. You can add it to your cooking to get its best health benefits. Mix a teaspoon of turmeric power in two teaspoons of honey and have every morning. You can also take turmeric capsules daily. Green tea provides many health benefits as it contains powerful antioxidants that help to keep our body tissues and cells healthy. It contains vitamin K that is important in maintaining liver health. You can have green tea four to five times daily at early stages of cirrhosis in order to get your liver back to normal. Since it contains high amounts of caffeine and other compounds, it is not suitable for pregnant women and those who have sensitivity towards caffeine. This is another useful herb that helps prevent the harm caused to the liver due to cirrhosis. Dandelion has a diuretic action that helps your body to eliminate the excess fluid collected in the body due to the malfunctioning of the liver. This will help reduce the swelling in your legs and abdomen. This herb increases the bile flow and should not be taken by patients who have cirrhosis due to blocked bile ducts. You can prepare an herbal tea with dandelion and have it thrice a day. Its juice can also be taken as an herbal remedy for cirrhosis. This herb has been used since centuries to treat liver diseases effectively. Milk thistle is one of the best herbs to treat liver cirrhosis in the early stages. It contains a compound called Silymarin that protects your liver from further harm and treats cirrhosis effectively. Silymarin also helps in regeneration of damaged liver cells. Crush a few leaves of milk thistle to extract the milk like substance and have a teaspoon twice daily to get its best health benefits. You can also take its supplements that are available in health stores. Licorice root has also been used as a traditional herbal remedy for the treatment of liver diseases since ages. It possesses strong anti-inflammatory properties that help prevent further damage to the liver when given at early stages of cirrhosis. Licorice root also helps flush out the toxins from the body which can cause further harm to the liver. It is a great liver detoxifier and you should have two cups of licorice tea daily if you are suffering from cirrhosis. Its capsules are also available in health stores. Stinging nettle is found all over the world and is used in the treatment of many health conditions. This is a powerful herb that helps to purify the liver and removes harmful toxins from it. You should take a tablespoon of its fresh juice before every meal if you are suffering from cirrhosis. It will help eliminate toxins from your system and maintain the health of your liver. You can prepare fresh juice from its leaves, or get the supplements from any nearby health store. Burdock root has been used in tradition medicine since ages due to its strong diuretic and diaphoretic properties. It is also a blood purifying agent and is a powerful antioxidant. Burdock root is very useful as an herbal remedy for cirrhosis as it helps to restore the normal functioning of the liver. You can prepare delicious dishes with burdock roots as soups or stews. Prepare an herbal tea with dried roots of Burdock and have twice daily if you are suffering from cirrhosis. Greater celandine is considered a toxic plant but when used in right dosages it helps to treat many health conditions. It is a powerful liver cleanser and helps to flush out harmful toxins from your system. It can be used to treat all liver problems as it helps stimulate bile production and improves the functioning of the liver. So, if you are suffering from cirrhosis, have celandine supplements daily as it will improve the efficiency of the liver cells. Bearsfoot is popularly grown in gardens due to its rich and beautiful foliage. This perennial plant possesses many medicinal properties and is used for treating various heath ailments. It is traditionally used as a stimulant and laxative. Bearsfoot has a beneficial effect on the liver and helps to prevent its malfunctioning. If taken during early stages of cirrhosis, it will help in faster recovery. You can get its supplements from a nearby health store and have them regularly as an herbal remedy for cirrhosis.